This page describes a past event hosted by the Institute for Sustainable Cities and co-organized by NYC H2O. You can find more information about the event, including Adam Bosch’s slides used in the lecture, at this NYC H2O event page. You can view video of the event at this NYC H2O Facebook page. Adam Bosch, Director of Public Affairs for the New York City Department of Environmental Protection (DEP), will discuss how DEP operates, maintains, and protects the largest municipal water supply in the United States. 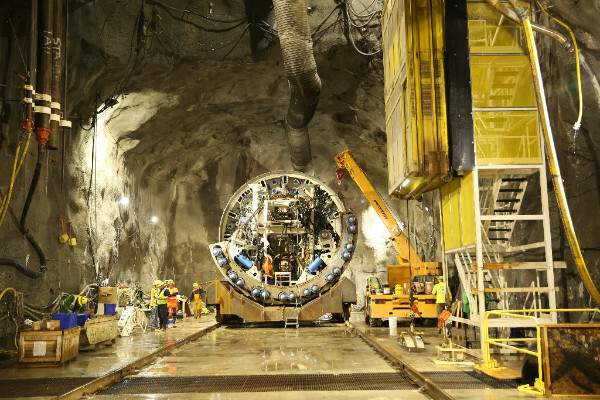 The talk will also include a special look at the $1 billion Delaware Aqueduct Bypass Tunnel project, the largest repair in the 176-year history of the City’s water supply. The water supply is considered a marvel of modern engineering. Its system of reservoirs and aqueducts supplies 1 billion gallons of water each day to 8.6 million people in New York City and another 1 million people in the counties of Westchester, Putnam, Orange and Ulster. The programs that protect its reservoirs in the Catskills are considered a worldwide model for protecting the quality of water at its source. As director of public affairs, Adam is charged with broadly sharing information about the City’s water supply with members of the public, local journalists, elected officials, and through education programs. Before joining DEP in 2012, Adam was a journalist in New York for more than a decade. His reporting earned five Associated Press awards for investigative reporting, breaking news coverage and public service. Adam Bosch will be introduced by Dr. Allan Frei, Hunter College Professor of Geography, and Deputy Director of the Institute for Sustainable Cities at Hunter College. Dr. Frei will discuss the ongoing climate modeling project he directs to understand the potential impact of climate change on New York City’s water system. This free event is presented in collaboration with NYC H2O, and is open to the Hunter College community and the general public. To RSVP for the event please click this link to the Eventbrite page.